If you are looking to grow Iris in containers, then Dwarf Bearded Iris are well worth considering. They also make a great plant for near the front of the garden border, or for growing along a low retaining wall. All the beauty of their larger relatives in a compact form. Varieties such as ‘Jack Spratt’, with its near black petals and falls, make a stunning addition to the garden or container. 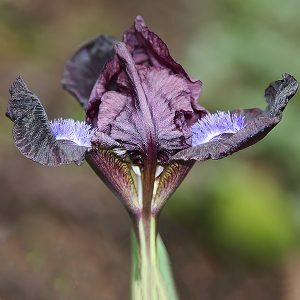 The smaller growing Dwarf bearded iris are really just a cross between the modern hybrids and naturally dwarf species such as Iris pumila. They are easy care, and come in a good range of colors. These smaller growing Iris are wonderful little garden plants will reach between 10 cm and 20cm. The actual height of any dwarf bearded iris can vary a little depending on the hybridization. Excellent plants for growing in containers, or for planting in clumps in the perennial border. Plant then near the front where they can be seen. Most growers will list the stem height of the cultivar, and it is well worth taking note of this when planting so they do not become over shadowed by taller plants. These low growing iris may look a little delicate, however they are just as hardy as their larger cousins. Dwarf varieties of bearded iris have very shallow root systems, and require a well drained soil and a sunny position. They need to be kept weed free, as they find it difficult to compete. Best planted in containers or near the front of the garden border where they can be seen, also excellent in a window box.